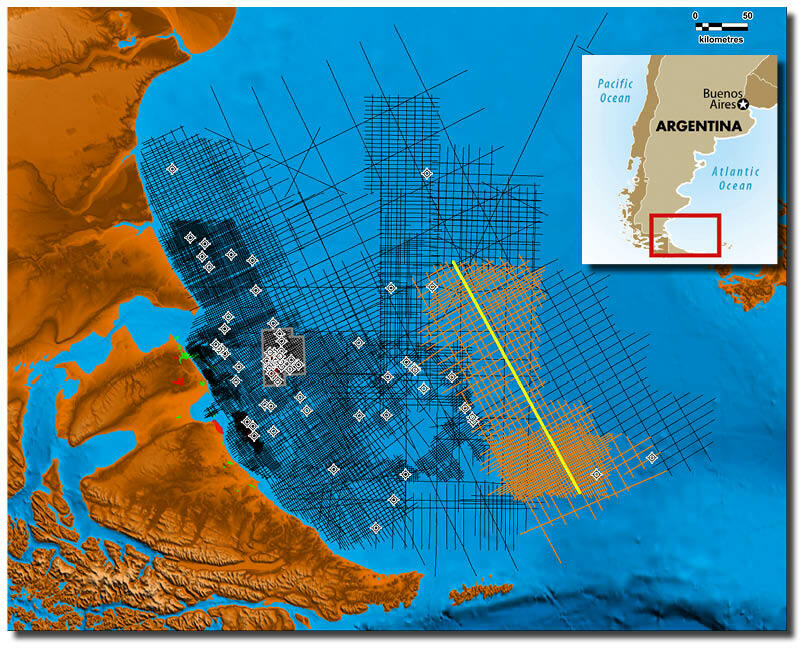 New regional reprocessed 2D seismic reveals the prospectivity and hydrocarbon potential offshore Argentina. Location of Searcher Seismic reprocessed seismic data. Image credit: Searcher Seismic. Argentina, an area of world class petroleum potential, has experienced growing demand for high quality, regional datasets in advance of upcoming bid rounds. The Malvinas Basin, offshore Argentina, appears increasingly promising, as newly reprocessed 2D seismic reveals older play types and source rock potential. In this highly prospective region, all exploration play elements – structure, reservoir, seal, source rocks, maturity and timing – are in place. Both extensional and compressional structural styles exist with multiple stacked reservoir levels and world class oil-prone source rocks. Basement highs that may be transgressed by mature Los Molles Formation. 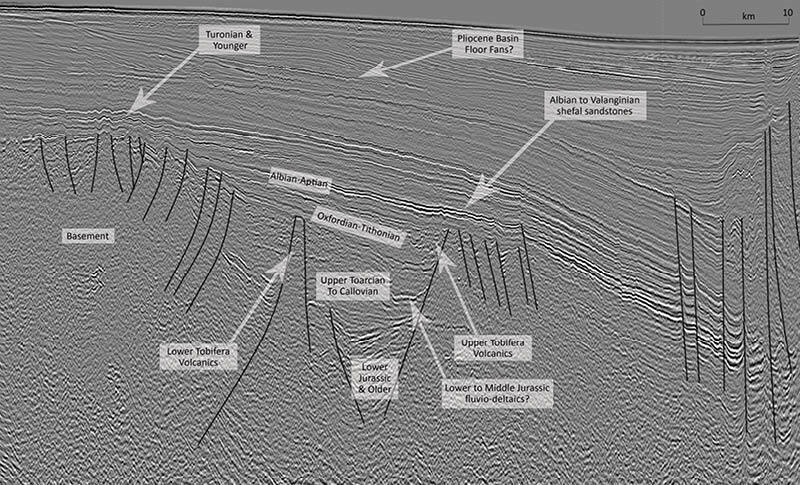 Searcher de-ghosted PSTM migration seismic line, illustrating stacked rifts and additional stratigraphic section of the Early Jurassic and older age, and some of the main plays present in the Malvinas Basin (Jablonski, 2017). Image credit: Searcher Seismic. The Searcher Seismic 2018 broadband pre-stack time migration (PSTM) reprocessing flow allows for the identification of these plays. The seismic below demonstrates four different stratigraphically-aged rifts, each potentially with mature source rocks, as well as eight different plays including two new ones in Upper Jurassic break-up unconformity transgressive sandstones and Lower to Middle Jurassic fluvio-deltaics with in-situ migration from the Los Molles source rock equivalent. It is also possible to note clear differentiation between volcanics and sediments and between the Upper and Lower Tobifera Formations. Within the Malvinas and surrounding on and offshore basins well density is highly variable. Onshore, basins such as San Jorge and Astral-Magallanes are covered by thousands of wells. However, offshore the well locations are sparse, with most of the exploration drilling completed in the 1980s. The North Malvinas and South Malvinas drilling was also relatively sporadic despite early success with the Sea Lion oil discovery. The 2016 Darwin-1 360 MMb condensaterich discovery testifies to the high exploration potential in the region. Hydrocarbon occurrences in the area are widespread at various stratigraphic levels. A vigorous post-well analysis is currently being conducted by Searcher Seismic to further understand drilling outcomes within the region. With the approaching bid rounds and the release of new data offshore Argentina, the future is exciting for exploration in this region. Searcher’s newly reprocessed seismic will enable more confident identification of hydrocarbon occurrences and exploration plays, essential for petroleum exploration.